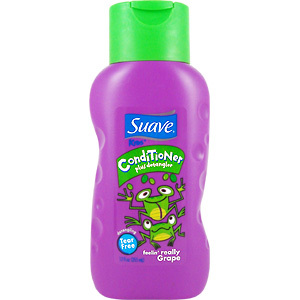 Suave Kids Conditioner plus Detangler will change the way kids feel about grooming by gently combining conditioner and detangler in one sure and speedy step...for less than the more expensvie brands. Ophthalmologist Tested Formula is tear-free and easy on the eyes. Creamy Formula with Gentle Conditioners tames flyaways and frizzies and soften hair after swimming and playing outdoors. After using Suave Kids 2 in 1 Shampoo, squeeze a quarter size amount into palm, apply to wet hair, then rinse. 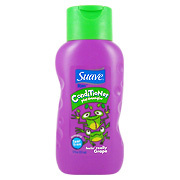 Follow with Suave Kids Detangling Spray. CAUTION: For External Use Only. Keep Out Of Reach Of Young Children Except Under Adult Supervision. 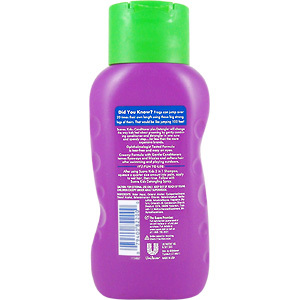 Kids Conditioner Plus Detangler is shipped in a discrete, unmarked package. Orders are processed immediately and usually take about 3 to 5 working days to be received. We do ask that you try it for 2 to 3 weeks to feel the full effects. Any information received is used only for order processing and shipping purposes. Your information, such as e-mail address, will never be disclosed to a third party.